SmartLocalShoppers.com is an unique local marketing platform to help local businesses publishing their local store coupons, and restaurant coupons in a printable format that will bring local businesses organic search engine traffic. SmartLocalShoppers.com differentiates itself from other so-called local marketing companies by optimizing every store pages for search engine indexing based on each store’s targeted audience. SmartLocalShoppers.com looks for optimized short key phrases and long tail keywords to generate highest search engine ranking. As you can see in the above screenshot on Google Analytic report. 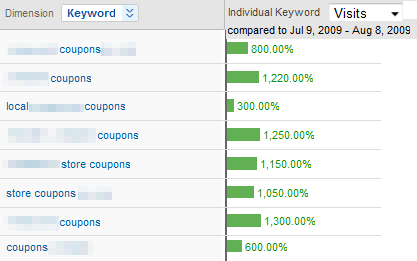 The local coupon related search has jump from 300% to 1300% in just matter of one month. If you read our previous post about “Printable Coupons to rescue local businesses“, you know that Printable Coupons search has increased 500% in the past 3 years. Local businesses should take this advantage and trend to increase their local oriented search and generate organic search engine traffic to boost their local exposure on the Internet. SmartLocalShoppers.com is here to help local businesses lowering their local marketing cost and increasing local sales and revenue by publishing local printable coupons at very affordable and reasonable price. There are so many local region based coupons web site out there, but most of them simply don’t do any good to local businesses. Why? SmartLocalShoppers.com wants to prove the fact that there is a better solutions to help local businesses grow at slow economy. SmartLocalShoppers.com optimize every store page for targeted audience and will also broadcast store printable coupons to other local coupon networks. Generating organic search engine traffic to target the right audience and local shoppers is the best solutions to ensure the local business success. SmartLocalShoppers.com is not just another local coupon web sites. Smart Local Shoppers is built with solid IT foundation with one simple goal to help local economy. Local businesses should take the advantage and start publishing coupons online without the worry to spend too much. With Smart Local Shoppers’ unbelievable offer, local businesses can save huge money with expected results. SmartLocalShoppers.com offer local businesses low cost, high relevant and better ROI local marketing solutions. Don’t waste your precious money on expensive local marketing or local advertising that don’t work for your local businesses. Publishing local coupons online is as easy as singing ABC. « How to get your local business on top of Google search for no extra cost?